Minerva Punjab FC registered their first league victory in the Hero I-League with a 2-1 victory over Mumbai FC at the Guru Nanak Stadium, Punjab on Saturday, 4th February 2017. Baoringdao Bodo (57th) and Anirudh Thapa (66th) scored for the I-League debutants whereas Karan Sawhney(77th) reduced the margin of defeat for Mumbai FC. The first half of the game remained goalless despite some good chances being created. In the 57th minute, a deflected cross from Anirudh Thapa saw Baoringdao Bodo drawing the first blood for the home team. Shortle after, Thapa doubled the lead from a corner which Mumbai FC custodian Kattimani failed to save as the ball went in from the far post. Karan Sawhney headed home from a Steven Dias corner but the equalizer never came from Santosh Kashyap's side. 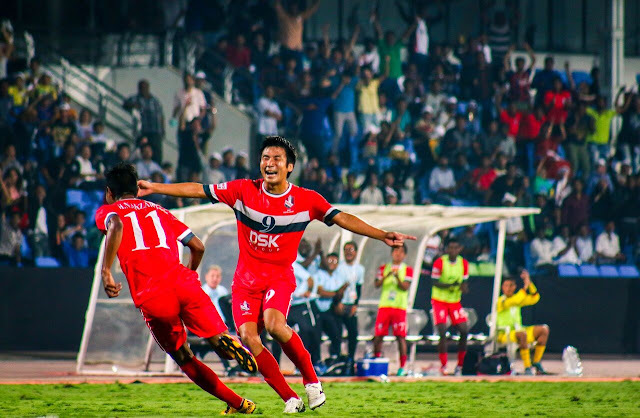 Anirudh Thapa was awarded with the Hero of the Match award. 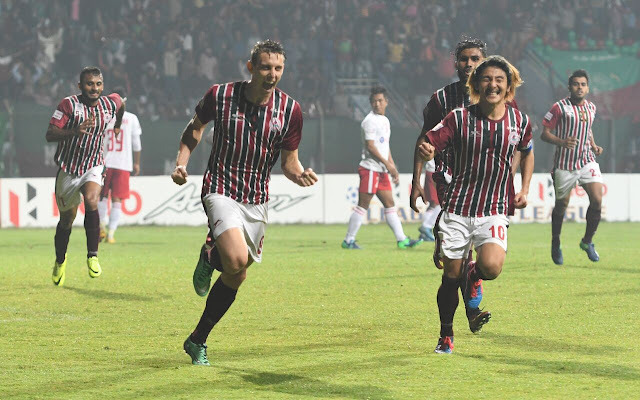 Mohun Bagan registered a hard fought victory against Aizawl FC in a five goal thriller at the Rabindra Sarobar Stadium on Saturday, 5th February 2017. Goals from Darryl Duffy and Jeje Lalpekhlua at crucial intervals ensured that the Mariners keep up the pace with their arch rivals East Bengal for the league title. It took Bagan just two minutes to go in front when Duffy found the net from a Katsumi Yusa cross. Both sides missed some glorious chances with Alfred Jaryan for Aizawl and Prabir Das for Mohun Bagan guilty of wasting some good chances. Finally it was Jayesh Rane, who equalized for Khalid Jamil's side when he scored past an empty net after Kamo Bayi's delivery beat Debjit all ends up. In the 63rd minute, Jeje Lalpekhlua then got Bagan ahead yet again when Prabir's exquisite delivery from the right needed only a touch from the forward to convert. Aizawl FC however had other plans as Jayesh Rane turned provider with his corner kick finding Ashutosh Mehta's head as the scoreline read 2-2. The goal scorer turned from hero to villian as Ashutosh Mehta tripped Katsumi Yusa inside the box and Duffy converting the resulting penalty to seal all three points for the Mariners. Shillong Lajong FC's home record seems to be making amends of their very poor away form. They started the Hero I-League with three away defeats and now are enjoying three back to back victories in their home soil. This time it was Churchill Brothers who had to taste defeat against the North East side. 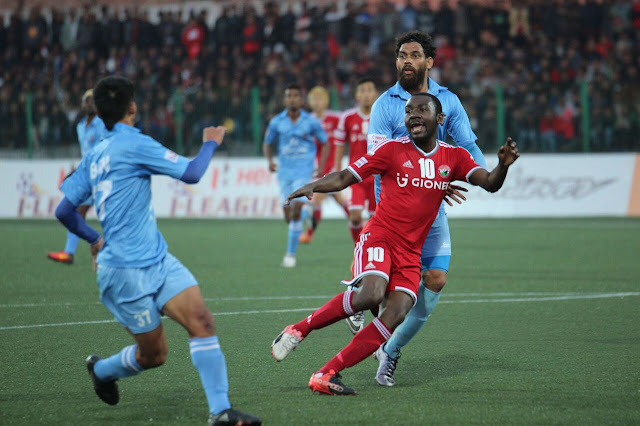 Aser Dipanda Dicka scored his sixth goal for the club which proved enough to register all three points for the team from Shillong. 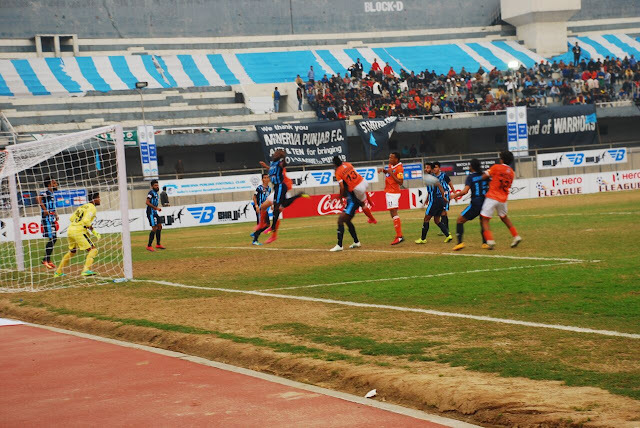 The goal came in the 51st minute when Priyant Singh fumbled a harmless delivery and Dicka made no mistake in finishing off. Lajong's Goalkeeper Vishal Kaith made some fine stops to ensure the victory for the hosts which took them to the top four in the league standings. Much like Lajong, Bengaluru FC's struggle away from home are not getting over anytime soon as Albert Roca's men dropped points against DSK Shivajians in their 2-2 draw at the Balewadi Sports Complex, Pune on Sunday in the Hero I-League clash. Holicharan Narzary scored a fine brace while skipper Sunil Chhetri and Salam Rajan Singh scored for the Blues in exciting clash. Holichara Narzary pouced on a defensive mix up and rolled the ball past an onrushing Amrinder to give the lead to the home side. Narzary made it 2-0 in the 55th minute for the hosts when he fired home from inside the box after another Bengaluru FC defensive lapse in the form of miscued clearance saw Narzary running past the defence all alone. Sunil Chhetri reduced the deficit in the 74th minute when he controlled a Cameron Watson diagonal long ball and applied a fine finish past Subrata Pal. The home side were made to rue their poor finishing as Bengaluru FC literally stole a point out of nothing after Salam Rajan Singh rose highest to make it 2-2 from a Watson corner at the very end of the match. 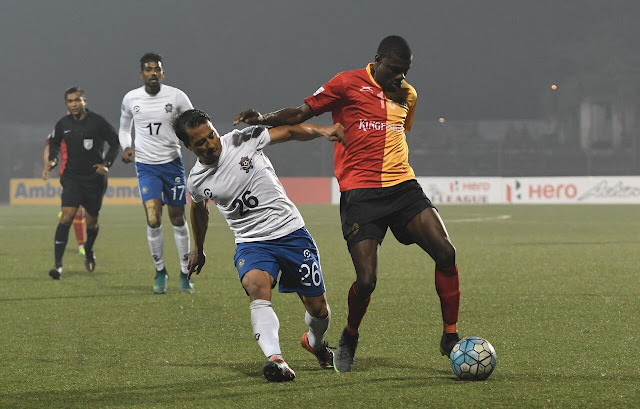 East Bengal's frantic run in the Hero I-League continued in the round 7 of Hero I-League also with a thumping 3-0 victory of the I-League debutants Chennai City FC. Willis Plaza, Wedson Anselme and skipper Lalrindika Ralte were all on the scoresheet for Trevor Morgan's side as they go to the much awaited Kolkata derby top of the league table. After a goalless first half, Lalrindika Ralte's delivery was finished off by Haitian forward Wedson Anselme in the 50th minute. Fan favourite Willis Plaza's stature kept on rising after another goal. Plaza's run was spotted by Wedson and the Trinidad and Tobago International applied a smart finish to seal the victory. Lalrindika Ralte add further authority in the victory when he scored from the spot after Thongkosiem Haokip was clumsily brought down by Echezona Anyichie, who had a good game before the incident.